The spirit of earlier generations of Bradfordians is legend. Their no-nonsense, get on with it, tell-it-as-it-is approach to life that the Victorians referred to as ‘pluck’. The Bradford of the nineteenth century was home to enterprise, innovation and industry so it is little surprise that its people brought the same attitude to sport as they did to business. This was the spirit of the town. Bradford people were purposeful: they worked hard and they played hard. Not surprisingly, sport played a big part in shaping and reinforcing a distinct Bradford psyche. It was cricket that originally defined a sporting culture and established a sporting tradition. The game provided a noble cause and a means to uphold local pride. It provided a model that was later adopted by (rugby) football. Until the final quarter of the nineteenth century the only organised sport in Bradford was cricket. The game both reflected and influenced the Bradford mindset. It was played for a purpose, to derive gainful benefit from recreation as well as to win. In the twentieth century the Bradford Cricket League provided expression to local pride and competition. In the nineteenth century Bradford Cricket Club provided respectability for the town and a demonstration that it could do better than its county rivals. Part of the Bradford instinct has come from a seeming insecurity to prove that the place is every bit as good, indeed better, than other towns in Yorkshire and there seems to have been a deep seated urge for outsiders to acknowledge what is good about Bradford. Cricket came to encapsulate that attitude, a chauvinist Bradford-first mentality and it became a means by which the townspeople could prove themselves in open competition. Bradford CC also assumed a paternal responsibility for providing entertainment for the citizens of the town and until twenty years ago the club hosted county cricket at its Park Avenue ground. The story of Bradford rugby and soccer – ‘football’ – begins with a history of Bradford Cricket Club. There are various reasons for this, not least that Bradford CC was a constituent of The Bradford Cricket, Athletic & Football Club that occupied Park Avenue from 1880 and it was originally the cricket club for whom the ground was built. The red, amber and black colours that were worn by Bradford (PA) AFC – and which are part of the modern identity of Bradford Bulls RLFC and Bradford & Bingley RUFC – were also inherited from Bradford CC. From its origins in 1863, Bradford FC was associated with the cricket club and shared its ground until 1870. As the first sports organisation in Bradford, the cricket club provided a benchmark by which the football club would judge itself, aspiring to the same level of pre-eminence in the town that the ‘old cricket club’ enjoyed. Bradford CC soon became an institution that defined how sport should be promoted and ultimately it played an important role in helping to shape a Bradford sporting identity, transferring the same Bradford-first chauvinism to the playing field. Although Bradford CC was formed in 1836 at the White Lion Hotel on Kirkgate in Bradford the gentlemen of the town were playing the game prior to that. Indeed, there is an earlier reference to a Bradford cricket club in the Bradford Observer of 21 October, 1830 in respect of a game against Otley at Apperley Bridge. Although this report appears to be the first reference to cricket in Bradford that is not to say that games were not played before then. Typically, the respective teams would play for a wager and the losers also funded post-match refreshments. Press comment was restricted to the version of events submitted by those involved – a practice that continued with regards to (rugby) football matches in the 1870s – and it can be assumed that victorious players would have been more inclined to provide a narrative. The Bradford Observer included reports of games involving the Baildon, Fairweather Green / Bradford West End (which appears to have been synonymous), Bradford Moor and Apperley Bridge clubs between 1834 and 1835 and the link with Apperley Bridge is particularly notable. There is a report in the Bradford Observer in September, 1834 of a game between ‘Bradford & Apperley Bridge’ CC against Leeds at Apperley Bridge. This may have been considered a select venue, a flat site in pleasant surroundings in the Aire valley, far removed from the smoke of the growing town (albeit not connected by railway until 1846). Another explanation is quite simply that the players lived there. In 1836 a Bradford club was established on a more formal basis. Writing in 1973, Denis Maude (then secretary of Bradford CC and author of its history) referred to the existence of minute books dating back to formation which provided a wonderful snapshot of the club’s life and the minutes allude to early games being played for stakes. Sadly, those records have since been lost. The first mention of the newly formed Bradford CC in the Bradford Observer was in July, 1836 (to advertise a forthcoming game with the West End club at Fairweather Green) and it may be significant that it came only a fortnight after a famous victory by a northern representative side, ‘the North’ against ‘the South’ at Lords. It is surely more than coincidence that this game appears to have been the impetus to formation. An article entitled ‘Reminiscences of the Bradford Cricket Club’ written by ‘one of the earliest members’ of the club and published in the Bradford Observer of 18 September, 1875 recounted that the club had been established purely for amusement and exercise. As I explain in my book ‘Room at the Top’ (Bantamspast, 2016) the prime motive behind the formation of the club in 1836 was party political, specifically to secure support for the Tories. According to the same article, ‘Reminiscences of the Bradford Cricket Club’ as above from 1875, the Horton field was used for practice and the club operated from Fairweather Green as well as Apperley Bridge before adopting a field above Mannville in 1839 (exactly opposite their first ground) – the site of Claremont off Great Horton Road – and this remained the home of the club until 1851 when it succumbed to development. The stone built villas still stand on Claremont, an address that was home to a number of German wool merchants including that of the family of the composer Frederick Delius who was born in 1860. The fact that the cricket club was called Bradford without any suffix demonstrates that the members considered it to be representative of the town and inclusive of the best players. It is unambiguous that in 1836 there was motivation among individuals for the town to have a principal cricket club much the same as other Yorkshire towns such as Huddersfield, Sheffield, Halifax, Knaresborough and Leeds (not to mention Yorkshire villages) who were already represented. Exactly the same imperative would later drive Bradford FC, consistent with the growing assertiveness of the town and its citizens and the desire for status and prestige, commensurate with rising prosperity. Civic rivalry was a theme that dominated the nineteenth century, lingering well into the twentieth century and it was not confined to competition in fields of commerce, architecture or civic accomplishments. Indeed the pride of Bradford decision-makers to demonstrate that their town was every bit as good, if not better than neighbouring towns invariably impacted on behaviours whether in the design of a town hall, measures of prosperity, charitable giving or how things in general were done differently in Bradford. Cricket – and later football (rugby) – could hardly avoid becoming another dimension of civic rivalry. 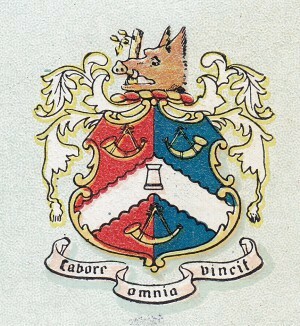 Bradford chauvinism – a Bradfordist or Bradford first agenda – was a dominant factor in the development of Bradford CC and was repeated in the case of Bradford FC. Both Bradford CC and Bradford FC would be assertive in claiming their room at the top and elbowing others when they got there. Bradford CC presented itself as being open to all classes and this represented tacit encouragement of spectators and gate taking, the basis of commercialising the game. Undoubtedly this would have turbocharged the development of the club which would have been well placed to take advantage of rising prosperity and population growth in the town. There is limited evidence about the size of crowds attending games which were reported to be as high as four thousand on occasions. People would have drifted in and out of the ground on the day of a fixture. At a meeting of Bradford Town Council in September, 1848 it was reported that policemen regularly attended games at the Claremont ground to detect pickpockets. It is unlikely that the growth of Bradford CC could have been achieved without broad appeal across social groups and this is supported by what was written in ‘Reminiscences of the Bradford Cricket Club’ in 1875: ‘For well nigh a quarter of a century, associations of the most friendly character were formed between manufacturers, merchants, tradesmen and working men without a shade of disrespect or overbearing assumption. The principle adopted was to select and encourage the best players that could be found, no matter what their position was or to what locality they belonged.’ It was the same approach adopted in business: that to be successful dictated the choice of recruits. In his article the writer mentioned ten former team mates who played for the club in the late 1830s and early 1840s. Of those, the average age of death was 35, the oldest being 39 years of age. The club had a couple of professional bowlers as early as 1840 and a professional player from Nottingham, John Hall was recruited in 1841. In May, 1850 a report in the Bradford Observer refers to a game at the club between 11 players and 22 amateurs (with the losers paying for the supper) which implies there were at least 11 professionals. The number of professionals at the club attests firstly to a shift in composition of the playing membership as well as financial strength. Quite clearly if professionals could be paid the club was successful in generating gate receipts and/or forms of sponsorship. Bradford CC benefited from the rising population, and after 1850 from an increase in leisure hours but the popularity of the game was not simply about the spectacle. From the outset there was a close link with gambling and alcohol. In its preview of the season the Bradford Observer reported on 12 April, 1866 that the programme of fixtures ‘will induce the licensed victuallers of the town to direct their attention to the announcement that the refreshment rooms on the ground are to be let for the season.’ It was an arrangement that was later repeated at Park Avenue. Notable is that members of the Bradford CC at this time were J and T Spink because it was Messrs Spink & Son who later provided catering services at Park Avenue. During its first few years, games were restricted to opposition within near distance of Bradford and in the main within the modern day boundaries of the West Yorkshire county. It was not until 1846 that Bradford was connected to the railway network with hourly trains to Leeds and it was the railway that facilitated fixtures with clubs from further afield. In particular it made possible the annual visit of the All England touring side between 1848 and 1864. Notwithstanding it would be another 25 years before the rail network became extensive and in the meantime club games continued to be primarily against teams from the West Riding or East Lancashire. The growth of the club also demonstrates that there was a drive to succeed. In 1851 the club lost its Claremont ground as a result of property development, but at the time the talk was about the need for ‘pluck’ to secure a new home and achieve its aims. This was the same language as that of business. Needless to say the drive of the club’s leadership did not go unnoticed and according to Lillywhite’s Cricketers’ Companion in 1866 they had a ‘most energetic committee and a liberal subscription list.’ All of this was driven by a yearning for respectability and the recognition of outsiders. It was a classic arriviste, parvenu mindset. Bradford wanted recognition. A replacement ground was secured in 1852 that was occupied for the next 22 years – nearly double the period of occupation at the Claremont ground between 1839 and 1851. I refer to this as the Great Horton Road Ground although it was known at the time simply as the ‘Old Club’s ground’. This was situated almost adjacent to the original Claremont ground in the area bounded to the north-east by what is currently Back Ashgrove West, to the south-east by Easby Road, to the south-west by Laisteridge Lane and to the north-west by Great Horton Road. The cricket field occupied the first of two fields in the north-east area, which according to a map from 1871 represented about 60% of the total area. The second field, bounded by Laisteridge Lane was that later occupied by Bradford FC between 1864 and 1870 (and who played on the cricket field itself in 1863). In 1852, the club’s minutes recorded that £44 was spent levelling the new field at the Great Horton Ground and a further £17 fencing it off which was a not inconsiderable amount. The account in Maude’s history of the club suggests that the landlord of the first field was a Mr Booth (who may have also been the owner of Claremont) for which a £10 rent was paid. The facilities at Great Horton Road were basic, albeit considered an improvement on Claremont. In 1875 these were described as comprising ‘a brick built, covered-in pavilion, with separate divisions for players and spectators, a quoit ground and bowling green, and in late years a grand stand. In addition to the field being used for athletic purposes it was a pleasant resort for children and families near’. The quoit ground would have had appeal to the wives of members and it may have served to attract women to the club – something which had been attempted previously. The Bradford Observer reported on 4 April, 1844 that an archery club was being established at Claremont for those ‘who have no relish for the more laborious game of cricket.’ In September, 1851 the same newspaper described archery as ‘a favourite pastime with the ladies,’ probably confirming that this is what encouraged archery to be introduced. In 1863 Yorkshire County Cricket Club had been formed from a nucleus of Sheffield clubs that included Sheffield United CC, established in 1854. This prompted further rivalry with Bradford CC which arranged its own ‘Yorkshire’ games at the Great Horton Road ground between 1863 and 1866 to rival the Yorkshire CCC games organised by Sheffield. In each of those years Bradford hosted Notts CCC at Great Horton Road. The opponents may have been deliberately selected to cause maximum pique to Sheffield on the basis that games with Notts CCC were considered an anchor fixture at Bramall Lane. Unfortunately, persistent rain is understood to have caused a significant financial loss in June, 1866 and ‘county’ games were never again repeated at Great Horton Road. Bradford FC later asserted itself in the affairs of Yorkshire rugby football and established a tight grip on the functioning of rugby football in Yorkshire in much the same way as Sheffield with regards to cricket. This conduct was criticised by other clubs as being too exclusive but the conduct of Bradford FC may have been based on the experience of Bradford CC which taught that Bradford could not rely upon the generosity of other towns for a share of spoils in county sport. The lesson was that to ensure financial prosperity, a club had to be assertive in looking after itself. The Bradford CC balance sheet for the 1865 season was reported in the Bradford Observer on 15 February, 1866 which disclosed a loss of £41 and from the basic information provided it is clear that the club was reliant upon donations, having received £42 in that regard. In the absence of donations therefore, the losses would have been double. In 1865 annual subscriptions amounted to £158 and if we assume an annual subscription of 10s (NB £1 = 20s) it implies that there were at least 316 members of the club. Gate receipts amounted to £308 and on a conservative estimate that the average ticket price was 2d then it suggests aggregate attendances in the year of around 37,000 spectators. By any standard this was respectable and indicates that the organisation was a fairly significant concern as a business, let alone as a sports club. On the other hand, it was not sustainable if it could not make a profit or underwrite its losses. Based on a shortfall of £41, each member was theoretically liable for an amount equivalent to 26% of their annual subscription. In practice what this meant is that as a member you paid, let’s say 10s for your subscription but if the club lost money you were potentially liable for losses, in this case a further 2s 6d. Hardly the recipe to attract members who couldn’t afford, or didn’t want, the risk. The additional loss from the Notts game in June, 1866 would have exacerbated this issue still further and potentially created a vicious circle. If the number of members had declined in the wake of the losses in 1865 then whatever losses were made in 1866 would have had to be made good by a smaller number of members. If the club had debts, then it was not an inducement for people to renew their membership and then be made liable for them. Nor would it encourage the remaining members to take the risk with staging future high profile games. An editorial in the Bradford Observer in May, 1870 lamented that ‘losses due to unpropitious weather impacting on two or three games’ had deterred Bradford CC from staging county or All-England games. Later, in June, 1873 the Bradford Observer commented: ‘The prospect of seeing a county match on the Bradford ground, so long as affairs are left to be mismanaged by the Sheffield Committee, is no doubt as remote as it well can be.’ I find the reference to Sheffield significant and it may suggest that Sheffield had taken advantage of Bradford’s financial weakness, thereby compounding the financial problems further. The loss of premium fixtures would have been keenly felt by Bradford CC for whilst they carried the risk of losses they offered the potential of profits. Big games also encouraged members to join the club. To this day county clubs typically rely upon a handful of fixtures to balance the books for which reliance upon secondary fixtures tends to be insufficient. In 1873 the three day match featuring United South had generated income of £284 and a surplus of £89 which offset losses from other cricket activities amounting to £54. However, Bradford CC faced potential competition to stage big games and in 1866 a fixture between the United South of England and Bradford & District was hosted at Quarry Gap (the choice of venue by the visitors may have been determined by Bradford CC being unwilling to agree financial terms). There is evidence that the club responded to financial pressure by cutting costs and a report in the Bradford Observer in May, 1867 stated that Bradford CC had decided not to engage a professional that season for the purpose of ‘nurturing amateur talent.’ From 1869 the club turned to hosting annual athletic festivals as a means of generating extra income and in 1874 it hosted the Yorkshire v Lancashire rugby game (although made a loss of £80 from this game, attributed to poor weather). No doubt for reasons of financial necessity, fixtures with the cricket touring side, the United South of England were introduced in 1871. (The ‘England’ side included WG Grace for the visit to Bradford in 1873 and he later played at Park Avenue in 1883.) It is notable however that these games featured a combined Bradford side rather than comprising members of Bradford CC alone. The initiatives succeeded in increasing receipts which were reported at the club’s meeting in February, 1875 to have been £1,390 in 1874 (which generated a corresponding profit of £126 net of a loss arising from a county football game staged by the club). Revenues of this magnitude were considerable and reflected the scale of the club’s activity and status; it should be noted they were not matched by a football club in the town until 1883/84. The limited financial information available from reports in the press show that the club had little focus on profit as opposed to how much cash was available at a point in time. In 1873 the club declared a profit of £185 but a net cash outflow of £25 after expenditure of £210 on a grandstand. The club’s profits would have been higher still if it had staged only two events, its athletics festival and the United South fixture. At the end of the season the club had responded to the cash deficit by seeking donations from members. ‘…a number of gentlemen, who used to take a great interest in the club, and were active supporters of it in every sense, such as – Colonel Hirst and Captain Bankart – have turned their attention a good deal to other matters of late years. Reference to the Rifle Volunteers, established in Bradford in 1859 is noteworthy and it is understandable how it would have deprived Bradford CC of energy and leadership. At one stage it was even suggested that the Rifle Volunteers might form a rival cricket club. However, whilst various games were played between a Rifles XI and local clubs there is no reported evidence that the militia team became established as a regular competitor. With regards to the social composition of the club, I would highlight the observation above that the club had become a more socially exclusive organisation. The inference is that the club had previously been fairly broad-based in its membership which is consistent with the reminiscences in 1875 of the former member quoted previously. The threat of the ground being redeveloped had been rumoured in 1870 and indeed the same article in August, 1869 mentioned that the ground was only held on a yearly tenancy, despite the danger of it being converted into ‘highly eligible plots of building land’. Pre-emptive action was not taken to relocate which can only be interpreted as a major failing in leadership. According to a letter to the Bradford Observer, dated 11 September, 1875 the club was already suffering ‘the reduction in numbers in their Horton supporters.’ All the evidence is that the club had lost the vitality that it had possessed at the start of the 1860s and had failed to realise its original objectives. With the loss of its ground to property development at the end of the 1874 season, Bradford CC became dormant, described by the Bradford Observer in 1876 as being in an ‘enforced state of idleness caused by the loss of its ground.’ Its players were absorbed by Bradford Albion, Manningham and Leeds Clarence and the club was not reformed until 1879, in anticipation of the Park Avenue development. The manner in which the club collapsed had been a big disappointment and it made people all the more determined in 1879-80 to make the development of Park Avenue a success. Hence the enthusiasm and breadth of civic support that the project received. Furthermore, having been witness to the demise of the club, senior figures in the town probably felt obliged to get involved with what was described as its ‘resuscitation’ and to provide the direction that had previously been lacking. It was at this stage that Edward Briggs first became involved and he would play a major role in the subsequent history of cricket and football at Park Avenue along with his son, Harry Briggs. The Bradford Observer of 1 March, 1849 reported a meeting of the Weekly Half Holiday Association at which one speaker said ‘there were ways of spending the half-holiday not only unobjectionable, but very beneficial. He thought a good Cricket Club might be formed…In fact with sobriety and intelligence, it was difficult to fix a limit to the benefits which might result.’ Cricket was thus embraced by working men as a form of productive recreation, a purposeful way to enjoy one’s free time. The Saturday afternoon leisure time would have impacted on Bradford CC in a number of ways, such as by making it possible for more people to attend as well as play cricket, thereby increasing the club’s potential catchment. Religious leaders supported the Saturday afternoon holiday on the basis that no excuse would exist for Sunday recreations and the non-observance of the Sabbath; in other words, Saturday became institutionalised for leisure activity. In 1847 The Bradford and Wakefield Observer; and Halifax, Huddersfield & Keighley Reporter addressed the issue of Sabbath desecration in the Keighley area: ‘During several Sundays, a large number of young persons have almost incessantly amused themselves with football playing, shindying and gambling…The complainants of this annoyance (adjacent to a chapel occupied by a respectable congregation) have no wish to give unnecessary trouble; but now that the authorities have resolved to grapple with the grave matters of sewers and other sanatory improvements , it is hoped that it is only necessary to point out this Sabbatatical nuisance to ensure its immediate suppression.’ By drawing attention to child slavery in the mills Oastler and his followers were also drawing attention to the hypocrisy of Nonconformists and their relative values. After 1850 cricket became more widespread, more often than not played by works teams and the game was promoted by employers with a paternalist instinct to provide recreation for their workforce. There were also notable examples of teams representing the firms of German merchants which was considered a means of social assimilation. The encouragement of recreation by employers was not confined to Bradford and on his visit to Bingley in 1844, future Prime Minister Benjamin Disraeli cited the example of Lord Egerton who had founded a cricket team for his colliers (in Lancashire) who ‘enjoyed their pastime in the sunshine.’ No doubt it was also recognised as a means to enhance productivity through team bonding as well as offering an alternative to alcohol. The late Marxist history, E P Thompson wrote in The Making of the English Working Class in 1963 that: ‘The mistake, today, is to assume that paternalist feeling must be detached and condescending. It can be passionate and engaged.’ In the absence of further evidence, I am reluctant to be judgemental on the motives of employers. It was a reflection of the growing demand for leisure opportunities that by the 1860s local clubs were fairly common in Bradford including Manningham CC, formed as Manningham United, the earliest mention of which was in 1861 (the original Mann United) and Bradford Albion CC, formed in 1855. By 1865 Bradford CC itself had three teams, its third XI adopting the identity of Bradford United. As a low intensity game and not demanding of high fitness levels cricket was accessible to a wide range of people. This, and its traditional popularity as a national sport explains the take up. In terms of the hierarchy of Bradford cricket, Manningham and Bradford Albion were considered the strongest of the junior clubs but there were plenty more who could have taken their place. One such example included Eccleshill CC which dated from 1857. Eccleshill established a reputation for staging high profile games including one against the United All-England in 1864 (to celebrate the opening of their new ground) and in 1877 a fixture with a Yorkshire XI. In the 1870s it regularly hosted athletics festivals which attracted large crowds. Similarly, clubs were reported to exist at Dudley Hill and Oakenshaw in 1846. Possibly the longest surviving, Bowling Old Lane CC, was established in 1863. Saltaire CC was formed in June, 1865 with the blessing of Sir Titus Salt and had 140 founder members. (Keighley CC was re-formed in 1844 but I cannot say whether the current club is a direct descendant.) Others included Manningham Clarence (from around 1858) and Manningham Albion (originally formed as Manningham Young Albion in 1867), both of whom have relevance in the origins of Manningham FC. The formation of teams would have become a mutually reinforcing process driven by the popularity and respectability of cricket as a pastime. The spread of the game also reinforced a local identity and competition with neighbouring districts. Manningham Clarence originally played its games on the Belle Vue field off Manningham Lane, adjacent to the tree lined Belle Vue terrace that dated from the 1840s. The ground was utilised by other teams including Belle Vue CC (1853), the Bradford Bowl ’em Out CC (1854) and later Manningham Amateurs (established 1866, initially advertising for fixtures within a ten mile radius of Bradford). In September, 1874 Manningham Amateurs CC was formally wound up having been evicted and the ground eventually becoming the site of Belle Vue School which opened in 1879. (The club ceased to play after the 1873 season and its players transferred to other clubs, in particular Lady Royd CC.) Indeed, the loss of the Belle Vue ground was keenly felt and was the start of a chain of events in the search for a replacement sports ground in Manningham, eventually leading to Valley Parade in 1886. Cricket games were regularly staged in Lister Park after its opening in 1873 (and this became home to the Bradford Rising Sun, Belgrave Albion, Manningham Clarence and Manningham Albion cricket clubs among others). In May, 1874 The Bradford Cricketers’ Journal listed 45 cricket clubs in Bradford and its neighbourhood. Its issue of 9 May, 1874 highlighted that the Bradford Moor and Manningham Amateurs clubs had ceased to exist since the previous season and that the future of the Bradford and Bradford Albion cricket clubs was in doubt as a result of urban and railway development respectively. Between them, these clubs represented four of the leading sides in the town and it provides an illustration of how urban spread cast a shadow over the sport. In 1876, Great Horton CC was wound up as a result of losing its ground to development. The photo below shows the revived club in 1889. On 20 April, 1871 the Bradford Observer recorded that the Manningham club took a stance on selecting only bona fides members in its side, the inference being that other clubs relied upon ringers to gain an advantage. This can be taken as a reflection that club cricket was competitive with resort to whatever means was possible. In June, 1868 there had been a dispute between Manningham United and Windhill Educational CC in respect of the selection of a certain player who happened to be a professional. Manningham’s defence, as reported in the Bradford Observer, was that the individual resided in Manningham which gave the club ‘the right to his services as often as they can secure him.’ Equally it could have been a pointed reference to the club’s rivalry with Bradford CC and a suggestion that opponents of Manningham had sought unfair advantage. Writing in Victorian Bradford, edited by D G Wright & J A Jowitt (pub 1982), Tony Jowitt comments on the lack of class antagonism in Bradford and the relative harmony between classes in the period from 1850 to the 1880s. My investigation of the social origins of cricketers and footballers at this time tends to support this assessment and as evidence of social interaction there was probably a higher degree of social integration in Bradford in the 1870s than might be the case today. Other examples from 1873 are of C Lonsdale, W H Couslon and W Renton who played for Manningham CC as well as Bradford FC. Renton lived at Clifton Villas at which there were two house servants; his father was a wool stapler. The inescapable conclusion is that Manningham CC was not entirely working class in its membership and that it sought talented players who lived in the district, irrespective of background. Newspaper accounts testify that there was keen competition between the Bradford and Manningham cricket clubs. A report in the Bradford Observer dated 2 July, 1863 featuring the game between the Bradford third XI and Manningham United CC commented: ‘An unusual degree of interest, considering the youth of the players, was excited in the game, which called out all the chivalrous spirit of the two ends of the town. There was a large attendance, including many gentry of Horton and Manningham, and not a few ladies.’ Rivalry existed between the two townships and at that time it was probably also a topic of conversation for the monied classes about which was the better place to live. In April, 1874 the Bradford Observer reported that Bradford CC had declined to play Manningham CC that season (as was the norm) on account of a fall out between the clubs about limiting the number of professionals in the sides. Manningham had requested that this be limited to one which Bradford CC, with its three professionals refused. (NB Manningham’s professional at that time was a Derbyshire CCC player so hardly insignificant. Of note, the same individual, George Hay is recorded to have been a professor.) As a measure of progress, in 1863 the Manningham United XI was playing against the third team of Bradford CC, but by 1871 it was reported that the Bradford second XI provided regular opposition to Manningham CC and these games caused ‘much clannish feeling’ (Bradford Observer, 20 April, 1871). If a gulf in standards had existed between Manningham and Bradford at the beginning of the decade, by the end of the 1860s there is evidence that this was closing. Notwithstanding it is notable that Bradford CC first XI confined itself to games against ‘The District’ rather than against Manningham CC and Bradford Albion CC individually. This was undoubtedly a face-saving measure to avoid the possibility of the town’s principal club being defeated by a junior club and created a precedent that would be repeated in 1876 by Bradford FC in respect of up and coming football clubs in the town. In September, 1869 The District subjected Bradford CC to a heavy defeat by an innings and 31 runs which spoke for itself. If there was a dominant theme common to most cricket clubs after 1850 it was the lack of security of tenure. In fact, the title ‘Finding somewhere to play’ would be apt for any history of Bradford sport. The loss of playing fields to property development had a major impact on cricket in Bradford and was the principal reason for clubs to be dissolved. It was an issue that would also determine the development of football in the town. Bradford CC lost its Claremont ground in 1851 and in 1874 it was forced to vacate its ground at Great Horton Road. The continuing danger of being made homeless and the lack of security of tenure constituted a threat to recreation and explains why the eventual development of Park Avenue was so significant, it represented the dream of a permanent sports venue. Manningham CC and Bradford CC amalgamated with effect from 1 January, 1896. The reason for this appears to have been the looming expiry of the club’s lease and the need to repay financial liabilities. Bradford CC saw this as an opportunity to strengthen its squad and for that reason was relatively generous in the terms offered to Manningham, agreeing to repay half its liabilities (which amounted in total to £250) and £50 by way of consideration for assets. It also inherited the club’s obligations in respect of rent and player contracts. Manningham CC was then left with an outstanding debt of £75 which was eventually repaid through an appeal to members. Six members of the Manningham club were elected to the Bradford committee including Rawson Robertshaw, a member of one of Bradford’s most famous sporting families and one of three brothers who represented Bradford FC in the 1880s. In 1907 there was the suggestion that the site of the former cricket club on Whetley Lane be adopted by Bradford City as an alternative to Park Avenue if the club could not get security of tenure at Valley Parade. On 13 April, 1874 the Bradford Observer reported that Bradford CC had been given notice to vacate the Great Horton Lane ground at the end of the season. The club was reported to have attempted to extend the lease and then to purchase the ground but the proposals were declined by Francis Powell. In November, 1874 the club was offered a site on east side of Laistridge Lane near Horton Green. At its meeting in February, 1875 it was decided to make a public appeal to raise the £2,000 necessary to level the field. However, Powell would only offer a ten year lease and the members were averse to make a financial commitment without security of tenure and hence during the 1875 season they negotiated a monthly rolling tenancy at the Great Horton Road ground. Uncertainty about when building work would commence meant it was impossible to organise fixtures and so the field was used for practice only. The Bradford Observer of 8 September, 1875 confirmed that discussions had taken place with Henry Illingworth for a ground at Lady Royd but these were aborted as a consequence of a £150 annual rent being demanded and the cost of development. By comparison, in 1865 the club had paid an annual rent of £27. Subsequent correspondence to the paper speculated about adopting a club ground but none were considered ideal whether in terms of tenure, convenience or standard. With the failure to secure a replacement ground Bradford CC was forced into a dormant state until 1879 when it was revived. A subsequent report in the Bradford Observer on 4 May, 1878 referred to the fact that ‘many years ago the Corporation succeeded to a fine stretch of ground which had been levelled for cricket in Peel Park, but on which the wickets have never yet been allowed to be pitched. Perhaps we may then get to know why this should be, and if there is, why a ground has not been formed in some other portion of the Park… There is also, it may be remarked, a Park at Manningham, and the further portion of this estate would be none the worse for a little ‘development’ as a cricket arena…’ Although football was staged in Lister Park after it opened in 1873 until 1879, a formal cricket field was never developed. The Yorkshireman reported on 2 June, 1883 that ‘the Park Committee, or whoever it is who has the control of such matters, forbid the poor lads of the town from having a corner set aside for them… to play cricket.’ The suggestion was that cricket was banned at the behest of the ‘swells’ watching band performances who presumably considered the play to be a nuisance. The Leeds Times of 7 July, 1877 reported that plans for Horton Park included a cricket ground ‘at the airiest part of the site, shut off from the park proper, so that the cricketers will be out of the way of the promenaders.’ Had the Park Avenue site not been secured it is possible that this could have been adopted as a home for Bradford CC. Elsewhere in the town, in 1880 the Corporation announced that it had acquired Bradford Moor for the intention of developing a recreation ground that included a cricket field which may have been an act of political expediency given the lack of playing fields in the district. For example, this followed the demise of Thornbury CC in 1877 and previously Bradford Moor United CC in 1874 as a consequence of urban development. Bowling Park was opened in September, 1880 being 52 acres in size and slightly smaller than Peel Park and Lister Park. The original design for the park in 1878 included a cricket ground which was also referred to in a newspaper report of 1883. However, an 1893 map shows that it was removed which appears to be evidence that, from the experience of football in Peel Park and Lister Park, Bradford Corporation specifically discouraged organised sport in park grounds. After Bradford Trinity FC vacated Peel Park in 1885 to share the ground of Undercliffe CC, organised football was no longer staged in Bradford parks. Although there is evidence of football continuing to be played, it tended to be at a low-level involving what might be described as junior feeder clubs and subsequently school teams. Although there is no detail to substantiate, I suspect that it was concern about attracting the wrong kind of spectators to the parks – those who might be inclined to gamble and get drunk – that determined the Corporation’s policy. So too, gate taking would have contravened park regulations. Bradford CC had a finite capacity as to how many teams it could field so it was inevitable that new clubs would emerge within the town, potentially as competitors. Whilst the original pre-eminence of Bradford FC was later challenged by Manningham FC, as far as cricket was concerned no rival club emerged in Bradford to challenge the status of Bradford CC which remained the pre-eminent body and civic representative. Competition existed from Manningham CC and Bradford Albion CC but neither had the opportunity or means to challenge. One reason for this was that the competitive structures did not exist for Manningham or Albion to overtake Bradford CC. In the absence of a league or cup competition, fixtures with other clubs were based on relationships, reputations and status and in that regard the ‘old’ club could not be challenged and would always attract premium opposition. Another reason is that neither Manningham CC nor Bradford Albion CC possessed a ground considered satisfactory as a civic arena (which is a likely reason why Bradford CC did not merge with Manningham CC in 1875 when it was made homeless). Both were vulnerable to urban development with Manningham being forced to relocate on three occasions and Albion losing part of its ground as a result of the Thornton railway being built. Nevertheless in 1878 both clubs were arguably much stronger than ever before and were obvious candidates to assume the mantle of civic club from Bradford CC which had been dormant since 1874. An impetus for Bradford CC to be reformed may have been provided by the Bradford Observer in its feature on local cricket on 4 May, 1878 when it commented that ‘nothing had been heard in recent years of attempts to resuscitate the old Bradford CC’ and suggested that ‘Bradford Albion should assume the style and title of the Bradford Club. It has already drawn to itself a large share of the patronage, support, and ability that would have otherwise gone to the older club, and we think that the efforts which the committee have made to keep their undertaking on foot, often in very discouraging circumstances, entitle them to the further recognition and help which the change of name would bring.’ One of the individuals who had become involved at Bradford Albion CC was Edward Briggs along with his brother, Moses whose father owned the nearby Briggella Mills on Horton Lane. Bradford Albion CC was reported to be one of the most spirited and prosperous of the minor clubs although in 1871 it was considered sufficiently junior to merit fixtures only with the Bradford CC reserves. The Bradford Observer review of local cricket in May, 1878 would have served as a reminder to the former committee of Bradford CC that a decision had to be made for the future, whether to reform or whether to wind-up. Later that summer, in July, 1878 came news that plans were being made to re-establish Bradford CC, eventually leading to the development of Park Avenue and setting in process a series of events that redefined Bradford football. The dormant status of Bradford CC – which didn’t compete between 1875 and 1880 – was a precedent for the example of Bradford (Park Avenue) AFC. That club was re-established in 1988, fourteen years after liquidation of the original in 1974. Bradford CC was originally the senior partner in the Bradford Cricket, Athletic & Football Club established at Park Avenue in 1880 and although it was eclipsed by Bradford FC by the mid-1880s in terms of prominence and reputation, the cricket members at Park Avenue remained influential in the decision-making of the umbrella organisation. Indeed, in 1907 they were among the constituency of members who sought a revival of rugby union at Park Avenue. In 1879 there had been an almost arbitrary division of the site at Park Avenue for the new sporting enclosure with the cricket club allocated two-thirds of the land and the football section the remainder. The fact that cricket occupied the higher land – being better to drain – may have also been deliberate. However, the future of the Park Avenue ground was subsequently dictated by football finance. In 1892 the freehold of the site had been acquired by the Bradford Cricket, Athletic & Football Club and in 1893 ambitious plans had been announced that involved expansion of the footprint above the cricket field, the construction of a grandstand along Horton Park Avenue and the creation of a three-sided football arena along the lines of Bramall Lane. The financial difficulties of Bradford FC in 1896 put paid to those plans and the expansion of Park Avenue never happened which limited the future potential of the ground for either soccer or cricket. Later, the financial difficulties of Bradford (Park Avenue) AFC and the abandonment of the football ground in 1973 impacted on the prospects of Bradford CC with Park Avenue becoming increasingly prone to vandalism and no longer a prestige venue. Accordingly, in 1996 Bradford CC vacated Park Avenue altogether and merged with Bingley CC at Wagon Lane in Cottingley. The story of Bradford cricket between 1880-1914 will be told in a future article on VINCIT. Other contributions about cricket in the district are most welcome for publication. Planned articles in the next few months include features on the impact of the railways on Bradford sport; the continued story of Keighley AFC; Bradford soccer clubs in the 1880s and 1890s; the story of Shipley FC; and the impact of social networks on the early development of Bradford sport.